In 1877, Paul Peel exhibited this painting and four others at Hood’s ArtGallery in his hometown of London, Ontario. That fall, the young artist left London for Philadelphia, where he began three years of art instruction at the Pennsylvania Academy of Fine Art. A Canadian Winter Scene bears a striking resemblance to a series of paintings completed by fellow Canadian painter Cornelius Krieghoff between 1850 and 1862. 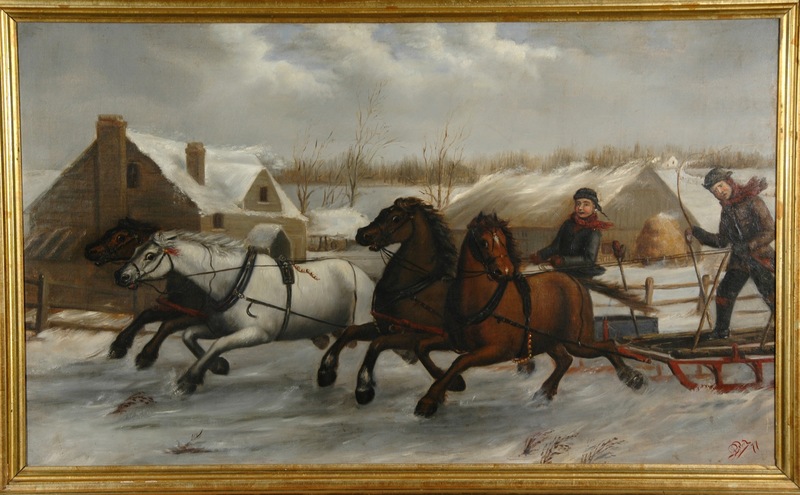 Krieghoff’s paintings (variously titled The Toll Gate, Bilking the Toll Gate, and Cheating the Toll Gate) depict three habitants on a sleigh urging their horse to speed through a toll gate to avoid a fare. Peel uses a less obvious narrative—here, two young men seem to be racing each other joyously on their horse-drawn sleighs—but he employs similar scenic elements (a snow-topped cottage, scrub-covered hills) and echoes Krieghoff’s compositional choices. At this early stage of his career, Peel is still searching for a style and for subject matter that he can call his own. He would begin to find his own direction in Philadelphia and, later, in Paris before his death in 1892.